Mexico, May 24, 2018 – It was at the invitation of Universities Canada that the Executive Director of the Inter-American Organization for Higher Education (IOHE), Dr. David Julien, traveled to Mexico City from May 23 to 25, joining the delegation of university presidents participating in this Canada-Mexico Mission. Following the participation of the IOHE in the Canada-Mexico Partnership Working Group, initiated by the two states within the current North American context, and in response to the desire expressed by both countries to strengthen their bilateral partnerships, the mission included as objective to pave the way to and establish long-term collaborative relationships between Universities Canada’s higher education institutions and the National Association of Universities and Institutions of Higher Education (ANUIES), as well as to the new Mexican federal government that will come to power at the end of 2018. Partnerships between Canadian and Mexican universities play an important strategic role as Canada works to renew and deepen trade and political ties with Mexico. “Canada and Mexico continue to play a key role in our community life and the recent lifting of entry visas required for mobility between the two countries is helping to build more flexible and sustainable partnerships between our members. The hosting of the ciKi in September by the University of Guadalajara, which ensures our vice-presidency, will also offer concrete opportunities for exchanges between professors and researchers on the themes of innovation,” underlines Dr. David Julien, IOHE Executive Director. 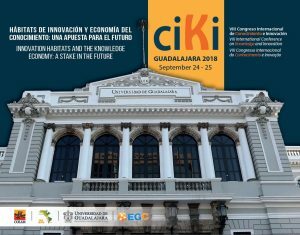 The International Conference on Knowledge and Innovation (ciKi) will take place in Guadalajara under the theme “Habitats of innovation and knowledge economy: A stake in the future.” Different levels of government on both sides of the border support the ciKi to strengthen these exchanges.